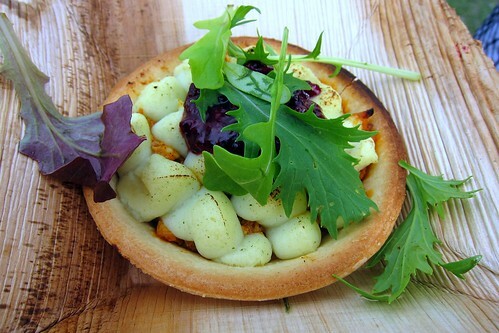 Dishes from the pop up restaurants required payment in the form of one token per dish, on sale at £5 each. Sadly these tiny raffle ticket-like stubs caused a bit of heartbreak right from the start as we instantly misplaced one. There goes a fiver down the drain! We had to console ourselves with the fact that I’d been lucky enough to win tickets to the festival in a competition from Taste of London, which at least got us free entry. 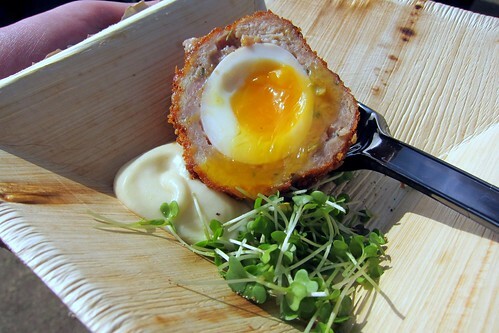 One of the most tweeted dishes of the festival was the Scotch Egg from Trinity which I knew was the first thing I must have. The flowing yellow yolk was absolutely gorgeous, as was the crispy crumb and creamy cider mayo. I’m always so impressed by the food that I’ve had from Trinity at festivals – I absolutely must get myself to their restaurant someday! My favourite dish of the day actually goes to Jamie’s own restaurant Barbecoa for their beautifully tender and flavoursome pit smoked barbecue pulled pork. 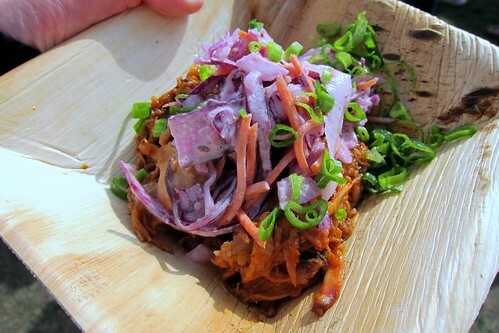 I am a sucker for pulled pork. I’m not usually partial to slaw though, but this one was great, not overdressed and I loved the sprinkling of fresh, green, spring onions on top. The chicken tikka pie from Benares was disappointingly not quite like the version they served in their restaurant. The beautiful flaky, puff pastry had been replaced for some reason with a crisp short crust pastry and a creamy potato topping. The filling was it’s usual tasty self and as a pie it wasn’t bad, but I still found myself hankering for the other version. 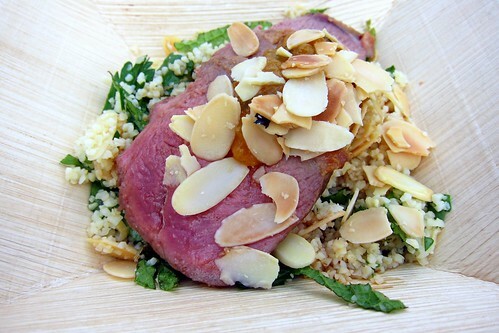 The pomegranate roasted duck breast from four o nine was tasty, and the duck was nice and pink but following the other dishes, it was difficult for this dish to make a particularly big impact on me. 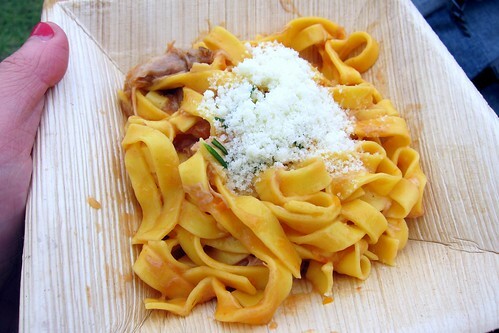 The pasta from Locanda Locatelli was not bad. I did enjoy the creamy ragu and the tender chunks of kid goat, but once again it just didn’t have the “wow factor” of the first two dishes. If I had realised sooner, I would have liked to have explored the non-pop up restaurant stands a little more who were accepting cash. One of these was Mussel Men who specialised in mussels, oysters, chips and chowder. Despite having to wait for about 10mins after ordering due to a broken fryer and missing a good chunk of Hercules and Love Affair’s set, I really enjoyed my moules frites. 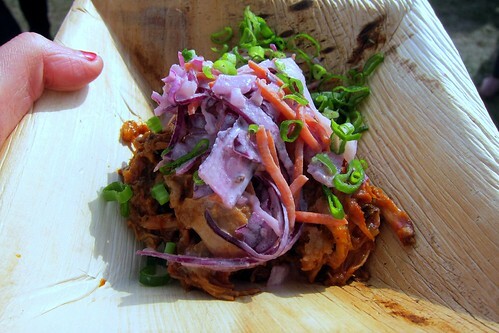 What a great idea for festival food! 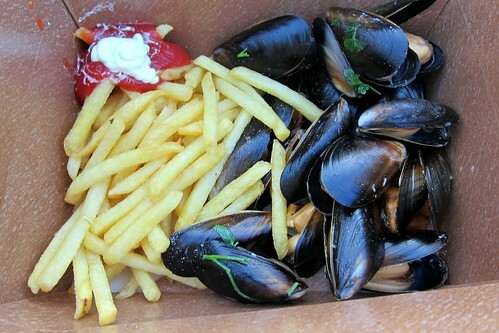 And it lead to one of my favourite moments of the day… dancing to Hercules and Love Affair while eating moules frites. At £6.50 I thought it was somewhat better value than some of the dishes from the pop up restaurants. Also not pictured but very much enjoyed was the tasty cob of barbecued corn with lashings of chilli butter for £1.50, and the large slice of sweet, juicy watermelon for £1. Although Jamie Oliver’s Big Feastival was clearly no Taste of London, I did enjoy it and thought it was a great idea. A few improvements could have been made in terms of purchasing and pricing. The whole pop up restaurants accepting tokens vs non-pop up restaurants accepting cash felt a little bit inconsistent and confusing. But it was the most family-friendly festival I’d ever been to and it was great to see so many families out there enjoying themselves; Dads rocking out with their kids perched on their shoulders, Mums having a boogie, and everyone enjoying the music and food selection. Let’s hope it returns next year even bigger and better.